Greendale Primary School is one of 10 schools with a food waste management programme. Pupils help to collect food waste during recess and turn it into compost for the school's gardens. As he slid plastic gloves onto his hands, 11-year-old Ray Yap inspected the large containers of dirty plates, bowls and cutlery lined up beside him on trolleys. Then he frowned. He had spotted a plate with leftover food on it. Ray had been tasked with an important mission a month ago: help his school Greendale Primary cut its food waste. That plate reminded him that he needed to redouble his efforts at the next recess starting at 9.45am. For the next half-hour, Ray and his friends Kellyn Loh, 10, and Triparna Poddar, 11, stationed themselves beside the plastic containers, reminding pupils to dump their leftovers into special green bins. The three pupils, members of the environmental science club, held the bins open for their peers, and even helped to pick up food which had fallen on the floor. The leftover food will later be turned into compost using a food-waste digester, in a process that takes about 10 hours. What food waste accounts for out of total waste generated in Singapore. The amount of food waste that is recycled here. The weight in tonnes of food wasted last year - about two bowls of rice per person a day. 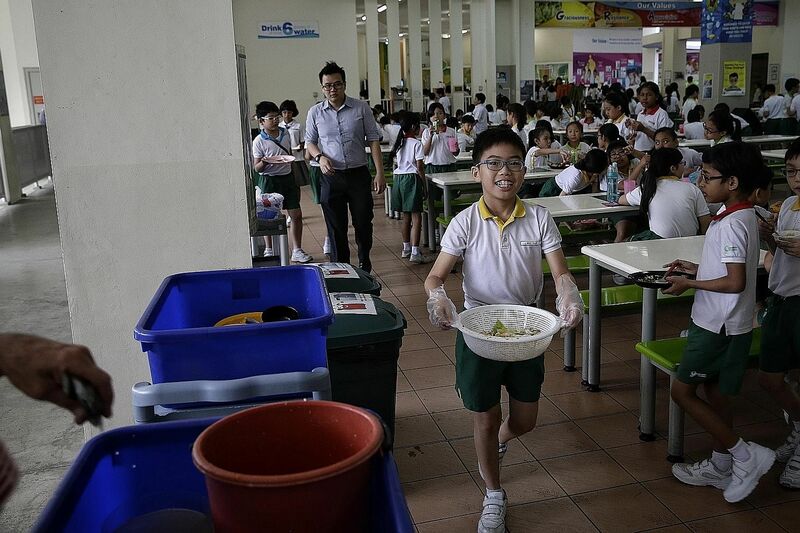 Greendale Primary's environmental education adviser, Mr Edwin Chee, 41, a science teacher, said the school started a food-waste reduction programme last month. It is among 10 primary and secondary schools that were leased food-waste digesters by the National Environment Agency (NEA) for two years under the Love Your Food @ Schools Project. The machines were installed in May. Food waste accounts for about 10 per cent of the total waste generated in Singapore, but only 14 per cent is recycled. Last year, more than 790,000 tonnes of food was wasted - equivalent to two bowls of rice per person a day. As of last month, all 10 schools have introduced programmes to reduce food waste. These include assembly talks on the topic and recycling food waste using the digester. At Greendale Primary, members of the environmental science club and Primary 5 and 6 pupils are rostered to participate in the programme, which also involves weighing the food waste collected at the end of every recess. A teacher will then pour the waste into a food-waste digester, which uses microbes to convert it into compost, to be used to fertilise the school's gardens. Canteen vendors also chip in by segregating their food waste. They also ask pupils if they want smaller portions. Said Mr Chee: "Changing the mindset and habits of pupils and staff was an initial challenge and we had an uphill task to get them involved... but there has definitely been improvement and the evidence is in the food waste collected." The school has cut the amount of food waste it generates daily from 17.9kg to less than 10kg. Similarly, Dunman High School has reduced the amount of food waste it produces from 20kg to 16kg per week since last month. At Dunman, the programme is led by a class of Year 4 students through the school's values-in-action programme, where students put core values into action through community service. The students put up food waste-reduction posters around the school and continually encourage their peers to segregate their food waste. They are also mentoring Year 2 students to help weigh and then deposit the discarded food into the food-waste digester. The compost is used on school grounds and also shared with St Hilda's Community Services Centre, which caters to the elderly. Siah Bing Ze, 15, who is chairman of the class, said the experience has taught him that even small actions mean something. "I didn't know I could make a difference, even impact an entire school," he said. NEA said it hopes the project will encourage other schools to kick-start their own food waste-reduction initiatives. It added that it will consider relocating and leasing some of the food-waste digesters to other schools for another two years, after the current project ends. But for now, those involved are happy to do their part to cut food waste, even if it means sometimes getting their hands dirty. Ray from Greendale Primary said it is an interesting process where he gets to learn about recycling. His fellow environmental science club member Triparna added: "Maybe over time, we won't need to remind our friends to separate their food waste any more."